Live Zero: Aim for zero negative impact on the environment. Love Carbon: Stop seeing carbon as the enemy and start using it as a resource. Let Nature Cool: Support the biosphere’s ability to regulate the climate. Lead Industrial Re-Revolution: Transform industry into a force for the future we want. To determine whether climate experts think it is possible to take back the climate, Interface carried out a survey which provided evidence that 95% of climate experts do in fact think it is possible. The main reason for this is because we already have all the technologies and the capabilities to implement and realise change. Along with this, a number of experts placed emphasis on belief in humanity and hope, showing that an important factor for change is human willpower, creativity and imagination, as well as an optimistic attitude. These results offer some reassurance that it isn’t too late, the damage hasn’t gone too far, and we still have time to take back our climate. Much of the responsibility for providing a solution lies within businesses and organisations as a result of their power in our society. Interface’s report shows that the prevailing reason which could make the climate take back impossible is the current ‘business as usual’ lifestyle which unfortunately puts profits above all else. 95% of young leaders agreed that business is currently not doing enough, and frequently turns a blind eye to this major challenge we face. As well as this, a lack of will for leadership for change in politics and business will prevent any revolution from happening. There is a call for business and politics to work together to produce a solution and strive to rectify the damage we have made to return our planet to one that’s fit for life. To provide a solution in line with the four elements above, several actions were suggested. Firstly, raise ambition levels within organisations which encourages businesses to aim towards being more sustainable. Another action was to develop new ways of doing business by altering priorities and developing sustainable business models so profit doesn’t always come first. Next was influencing policy and implementing regulation, such as making a case for a carbon tax. Finally, partnerships and collaboration are key to driving change as they can have a larger impact than working alone, and set a positive example for the wider industry or region. The report concluded with sending the message that climate change is a fundamental threat to earth, but one that we can collectively do something about. Climate experts suggest that we need to build a narrative, start a conversation and reframe climate change as a positive opportunity rather than a disaster to avoid – something that Carbon Literacy strives to highlight. The Climate Take Back plan provides a framework for taking back control and influencing a positive change. So, instead of acting like climate change is just something for someone else to deal with, you can start acting on climate change today. 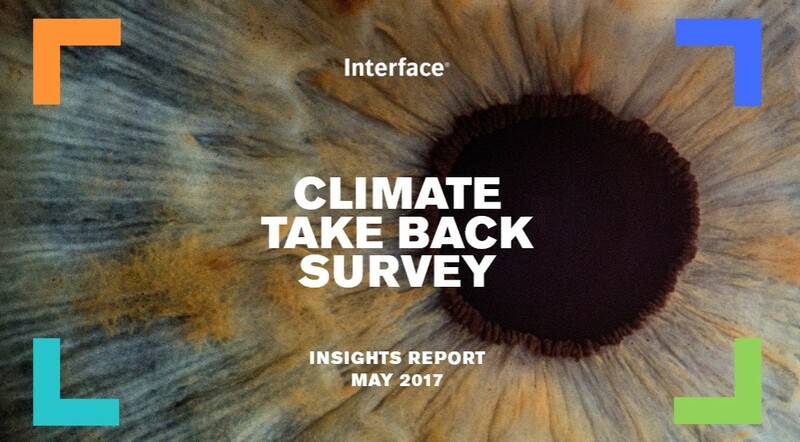 You can find out more about Interface and Climate Take Back here.